'The 'Flying Scotsman' pasing Hadley Woods, c 1906. 'The Flying Scotsman', LNER poster, 1925. Flying Scotsman, 26 September 1992. LNER 'Flying Scotsman', c 1929. 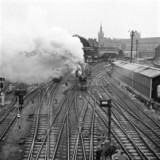 Flying Scotsman at King's Cross, 1963. 'Flying Scotsman' departing Scarborough station, 5 August 2004. Driving the controls of the 'Flying Scotsman', 31 August 2004. 'Flying Scotsman' travelling through York on route to Scarborough, 22 July 2004. 'Flying Scotsman' crossing Scarborough bridge, 21 July 2004. The footplate of the 'Flying Scotsman', 31 August 2004.